I have always been very particular about what materials I would allow on my feet in legs. For a refresher about my experience with ballet tights click here. Finding a great pair of comfortable socks has been a life long battle. My first memory of trying to make my socks scratch my legs the less began on the reading carpet in Grade 3. Our teacher Mrs. Bolton used to read us stories from her wooden rocking while we all sat on the carpet. I used to play with the suede on her pumps and somehow during this time myself and the other girls started rolling down our socks. Picture knee high socks being carefully rolled down to create a large roll at the tops of our ankles. This was my solution to create what I would now call ankle socks. We would spend a lot of time and effort rolling them down and afterwords the roll would be so large that it would prevent our jeans sweatpants from reaching our shoes. I might add that this was also the time in my life that I started wearing Hawaiian shirts to school on Wednesdays. I've struggled to buy comfortable socks that look good but also do not restrict my raging calf muscles. I currently have one pair of striped socks from Simons in Montreal that meet this requirement and I started handwashing them at night so that I could re-wear them the next day. I was avoiding every other sock I owned. I will also add that almost every pair of socks I own have been a gift from my Mother. It's not her fault though...I never took the time to tell her my sock issues. Recently, I got to the point where I hated all of socks so much that I just stopped wearing them all together. I would declare in the mornings, "I HATE ALL OF MY SOCKS!!" then throw my bare foot into a leather boot. This new style generally worked for me. I am lucky that I am not someone with "foot odor"(or at least I don't think that I do). Unfortunately, if I went anywhere where I had to remove my shoes in public, such as the doctors or dentist office, I would be stuck walking barefoot on freezing cold floors or getting salt and gravel over my precious peeps. The 'no sock' solution wasn't ideal. I needed to find socks I wanted to wear!! 4. How tight was the top of the sock? I've made the mistake of ignoring one of the four criteria on prior purchases, then I get home, try them on, hate them, and immediately need to give them away. It's a major waste of money but great for my Mom. On this particular day I spotted something I never knew existed. 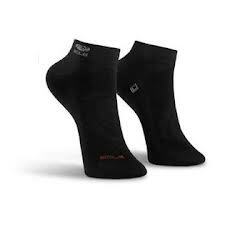 There was a black ankle sports sock! It was 1. plain black, 2. cotton, 3. had no threads inside and 4. only hit my ankle! I had been wearing my white sports socks as a treat on days that I knew no one would see my socks and I needed a little extra warmth. These new black socks would allow me to wear them in public and every day my feet would get treated with nice tight arch support. I bought a couple of pairs and loved them so much that I soon found myself doing the same thing that I did with my striped socks. I was saving them for important days, and washing them in the sink to have them the next day again. While at the new Joe Fresh store, I discovered something amazing...three pairs of black sports ankle socks for $6!!!! I bought two packs and I haven't turned back since. I currently have 9 pairs of socks which I love, and I can easily go back and buy more if I really want them. Everyday I enjoying selecting my socks and never feel like I am settling for something that I am going to want to rip off my feet by 2pm. Stop the sock at my ankle saves my calf from ever being restricted, and again that nice tight arch feels so good all day long. Why didn't I discover these sooner!?! !